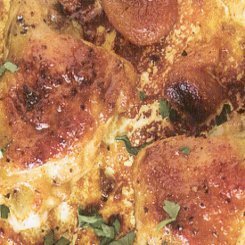 Take a large casserole dish that you can place a single layer of chicken pieces to cover the bottom or use more than one oven dish. Mix together the soup powders and coat eack piece of chicken in a fine coating of the mixture, shake off the excess and the lay skin side up into the casserole dish. 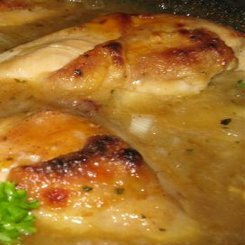 Pour 3/4 of the Ginger Ale into the casserole and then pour the remaing Ginger Ale into whatever is left of the soup powders, give it a mix and then pour over the top of the chicken. Cover your casserole and pop into the oven for 3 hours. If you don’t have a casserole dish with a lid, cover with foil. That is that, a delicious meal without any fuss. 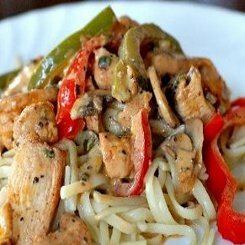 Serve with rice and salad. 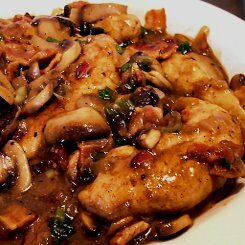 You can fancy it up a bit by adding a few mushrooms 1/2 way through the cooking process or mix in a tablespoon of apricot jam with the ginger ale and soup mix for those who like it a little sweeter. On a side note, for those of you who make beer can roast chicken, try it with Coke or Ginger Ale for a change! 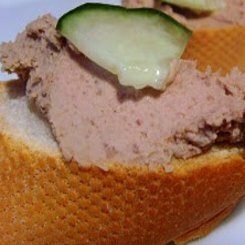 I am a big fan of chicken liver pate and of all the recipes I have tried, this has got to be the easiest of the lot. It’s not quite a baked chicken liver pate which is really fancy but well worth it, but it tastes fabulous and is always on call to feed the masses. Put a pan on medium to low heat and add butter, herbs and onion. Cook until the onions are soft and transparent. It should take about 15 minutes. Now add the chicken livers and cook until they cooked through. Now toss the whole lot, straight from the pan into a blender along with the salt, garlic, nutmeg, brandy and sherry and blend until smooth. Place in a bowl and pop into the fridge to chill. Serve with a selection of sliced pickles, crusty french loaf sliced thin, melba toast, fresh whole wheat bread and pita bread that has been crisped up in the oven and cut into triangles. Thats that, fantastic chicken liver pate that will last 2 or 3 days in the fridge. It’s National Braai day on Saturday so get out your braai and head off to the supermarket for a whole bunch of chicken wings. 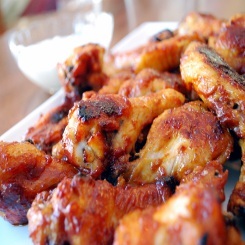 These Buffalo wings are simply lip smacking delicious and will be on my braai tomorrow for sure. 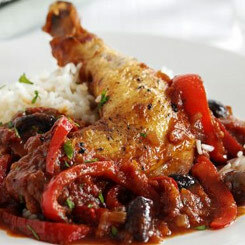 I may also make the Greek chicken pieces which are seriously easy and OH soo good. If you like your buffalo wings nice and spicy add some more tabasco or a teaspoon or two of chili flakes to the marinade or leave the tabasco out of you are not feeling fiery. This marinade works just as well with drumsticks and thighs so keep it as an any day chicken braai marinade. Joint the chicken wings removing the wing tips and separating each wing into 2 pieces, a mini drumstick looking piece and the middle piece. Toss out the wing tips or freeze them to make a chicken stock when you have enough. Add all of the marinade ingredients to a large bowl and give a good thorough whisk. Add the chicken wings and get your hands in there to mix it all up so that every chicken piece is coated in the marinade. Cover the bowl and place them in the fridge overnight or for up to 2 days. If you are doing them in the oven, cover a grill with tin foil, place the grill in the roasting pan and then lay out your chicken winglets. Cook them under the grill until the skin is blistering and you notice dark patches on the ends. Turn them and grill until the other side is equally blistered and crisp. Take them out of the oven, toss back into the remaining marinade and with a wooden spoon give them all a last little coating. Then back onto the grill, reduce the oven to 180 Celsius and leave them to crisp up for about 15 minutes. If you are doing them on the braai get your coals nice and hot so that the wings give off a nice sizzle when placed onto the grill. This can be quite challenging if you have a grill that has spaces large enough for a winglet to fall through but fear not, a piece of chicken wire placed over the grill does the trick. Move them around frequently until they are beautifully crisp and then back into the remaining marinade to before serving. The secret to a great baked potato is the heat of the oven. Baked or jacket potatoes as some prefer to call them are so under rated, they can be delicious, complete meals if you bake them properly and have a fabulous filling. To make the perfect jacket potato and by that I mean, steamy soft and fluffy on the inside and crisp on the outside, this is what you need to do. Take 4 to 6 large baking potatoes, scrub them clean and poke them with a fork all over about 5 or 6 times. Place them in a hot oven(200C) for about 50 minutes to 1 hour. They will be just perfect, a crisp outer skin and steamy soft inside. 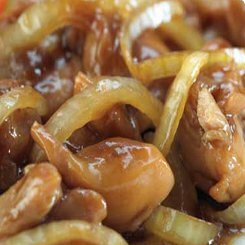 If you want a quicker meal, poke them and then simply microwave them for 10-15 minutes first (all together) and then place them in the 200 Celsius oven for about 15-20 minutes, they will be just as good. I generally make fillings with leftovers, like chicken, bolognaise sauce or whatever you have. Cut the potato length wise or a cross along the top and heap over your filling. Serve with a green salad or coleslaw. 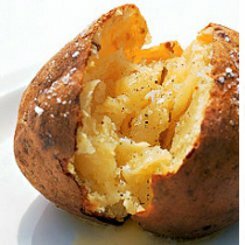 We all have certain favorite flavours, here are 2 of my favorites to fill jacket potatoes. 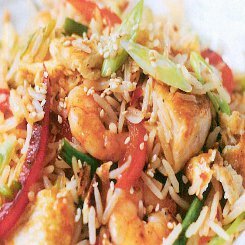 Chop up your leftover chicken(or cook boneless breasts or thighs), thinly slice a few spring onions and mix together with some cottage cheese and a generous grind of pepper and a little salt. Whenever I make bolognese sauce I always make a bit extra. Spoon over plenty of bolognaise sauce, grate some cheese over the top and place under the grill for a few minutes. There are endless fillings you can use for baked potatoes and are a great way to use up leftovers or vegetables when there is not enough to make a meal. I often stir fry vegetables like onions, peppers, cabbage and patty pans when I only have a few of each left, cover the potato, top them off with cheese and pop under the grill. Tonight, delve into your fridge and take out all of the leftovers or bits and pieces of vegetables that you will probably end up throwing away and make yourself a delicious baked potato.